The Blick 906 Etching Press is an economically priced press, ideal for home studios, art fairs, and schools. Every 906 etching press is hand built especially for us using only the finest quality, American-made parts. The 906 Press is gear driven for easy pulling of etchings, drypoints, engravings, collagraphs, linoleum block prints, and paper plate lithographs. Calibrated pressure adjusters let you see exactly how much pressure is being applied. 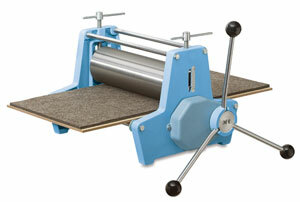 The 4" (10 cm) diameter, lathe-turned upper roll can be raised to accommodate mounted linoleum up to 22 mm thick. The total clearance without a blanket is 32 mm (1¼"). For the secondary school classroom as well as the individual art studio, the 906 is an excellent choice. Its maximum print size is 12" × 24" (305 mm × 610 mm) with the 26" (66 cm) bed plate, and 12" × 34" (305 mm × 860 cm) with the 36" (91 cm) bed plate. Printmakers have found that the lightweight 906 press travels nicely to art fairs and workshops. Removing the bed plate makes carrying the press easier. Bed plates and one gray ¼" cushion blanket are sold in a separate package from the press body. We recommend the additional purchase of a catcher and a pusher with your press. For Your Information — We recommend that you use three blankets — a cushion, a pusher, and a catcher — to equalize the pressure and lessen the strain on the upper roller shafts of your press. You will need a catcher and a pusher. The catcher blanket should be placed directly on top of your damp printing paper, the cushion blanket on top of the catcher, and the pusher on the very top. The catcher blanket should be washed regularly so that it doesn't become stiff from the sizing. 906 Etching Press Bench — Made of sturdy steel construction for the 906 press, regardless of its date of manufacture. It has a convenient storage shelf below. Stands 29" high × 50" long, and is 15½" wide. Wool Blankets — These blankets, especially for the 906 press, are made of fine quality, dense wool felt.